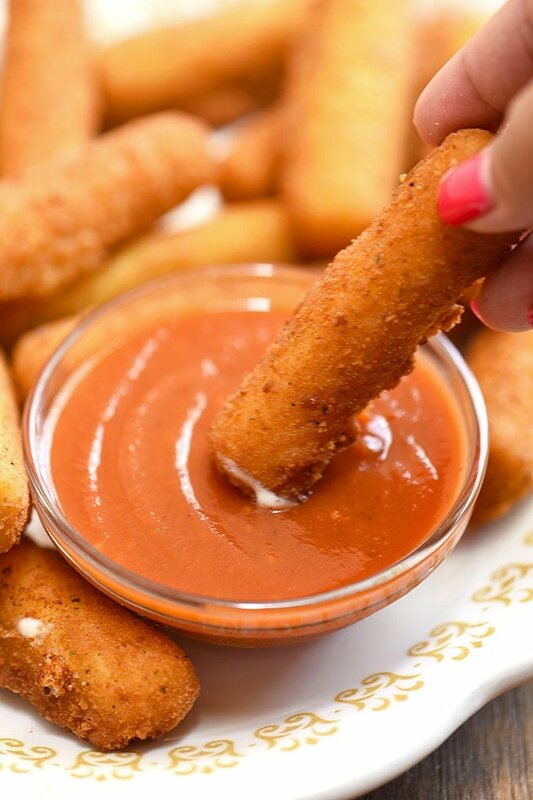 Homemade Mozzarella Sticks with marinara sauce are perfect for a party or game day. Gooey and melty on the inside and golden and crunchy on the outside, they’re absolutely addicting! Last Halloween I decided to give out individually-packaged string cheese instead of the traditional Twix or KitKat as treats for the tricksters passing by on ghoul’s night. But instead of an excited “woohoo, I got cheese” and a quick wave of thanks I expected, the goblin-masked and Ninja turtle-dressed little boogers wouldn’t budge from our doorstep, steadfastly standing there with hands still outstretched and a “that’s it?” look on their faces. After a while of this, I eventually caved in and reluctantly parted ways with the Dove chocolates I was hiding for/from myself. The well-intentioned mozzarella cheese sticks ended up in the dim recess of the freezer, forgotten until yesterday when I gave them new life as homemade mozzarella sticks with marinara sauce for dipping. 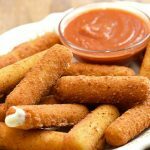 Homemade mozzarella cheese sticks are one of the easiest appetizers you can make, but they do involve a few tricks for best results. For convenience, I use string cheese you can find individually packaged in the refrigerator section of most grocery stores and usually cut them in half. You can also use fresh mozzarella and cut it up into 1/2-inch thick and 4-inch long if you prefer. After dredging the cheese in flour, dip in eggs, and roll in breadcrumbs, I do another round of coating for maximum coverage. The breaded sticks are then arranged in a single layer on a baking sheet to freeze for about 30 to 40 minutes. 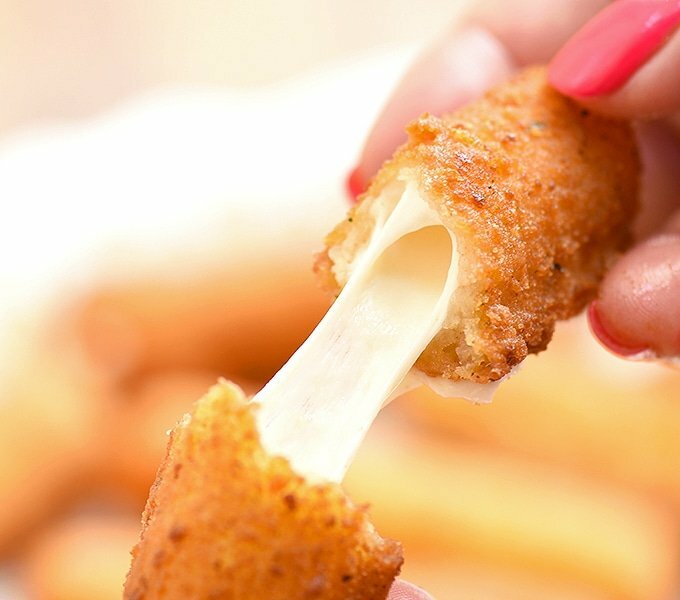 Don’t skip this step as it’s essential to keep the cheese from bursting and melting out of the bread coating during frying. 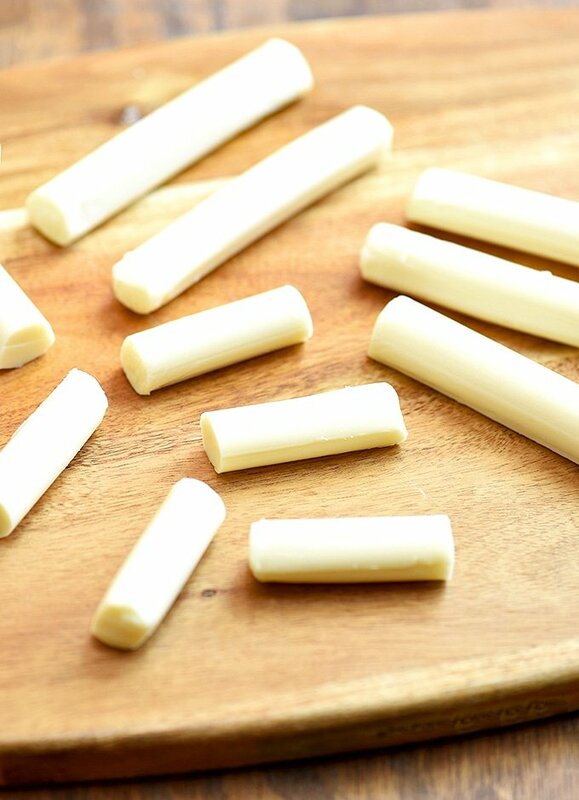 If you want to store the homemade mozzarella cheese sticks for future use, freeze them first on the baking sheet until firm before transferring to resealable bags to prevent them from sticking together. Along with freezing the cheese sticks before frying, another crucial component of the recipe is deep-frying at the proper temperature. Use oil with a high smoke point such as canola, safflower or grapeseed and make sure the oil is at 350 F to 375 F. Too hot and the breading will brown before the cheese inside is soft and melted. Too low and the cheese will melt and leak out before the outside has sufficiently browned. 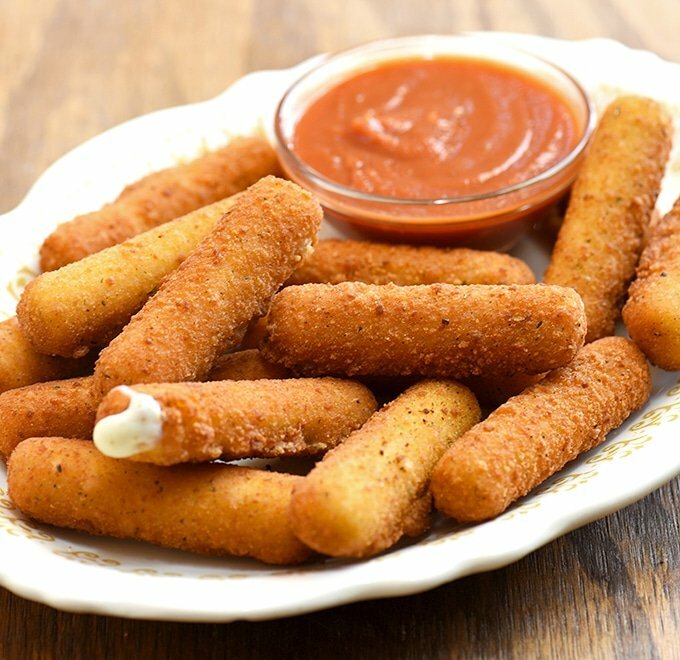 At optimal temperature, the breaded mozzarella should take about 1 to 2 minutes to turn golden and crispy on the outside and gooey and melty on the inside. You can make the homemade marinara sauce I included in the recipe card below or use your favorite brand. You can also serve them with carrot and celery sticks to complement the gooey, creamy cheese with fresh veggie flavor and texture. Want more finger foods and make it a real party? Try these Philly cheesesteak sliders and jalapeno poppers; they’re a guaranteed crowd pleaser! 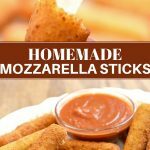 Homemade Mozzarella Sticks with marinara sauce are perfect for a party or game day. Gooey and melty on the inside and golden and crunchy on the outside, they're absolutely addicting! 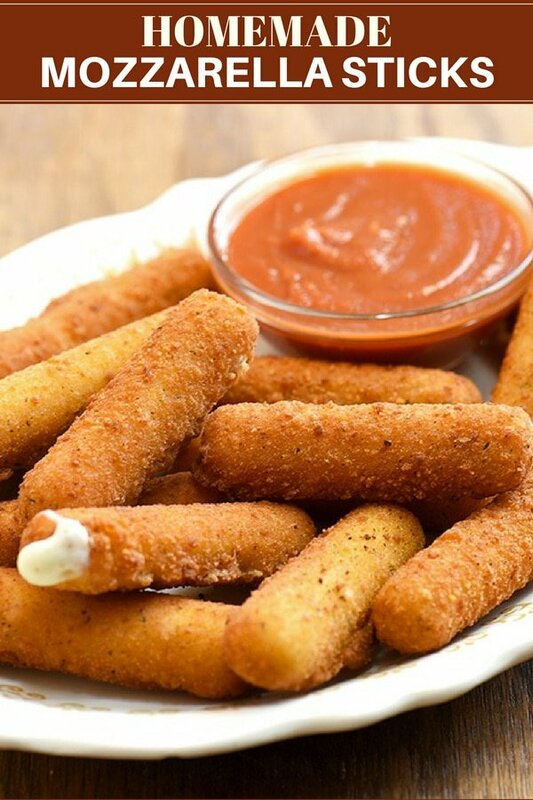 Remove mozzarella sticks from packaging and cut each horizontally into half. In a shallow bowl, place flour. In another shallow bowl, whisk together eggs and milk. In another shallow bowl, combine bread crumbs, Italian seasoning, garlic powder, and salt and pepper to taste. 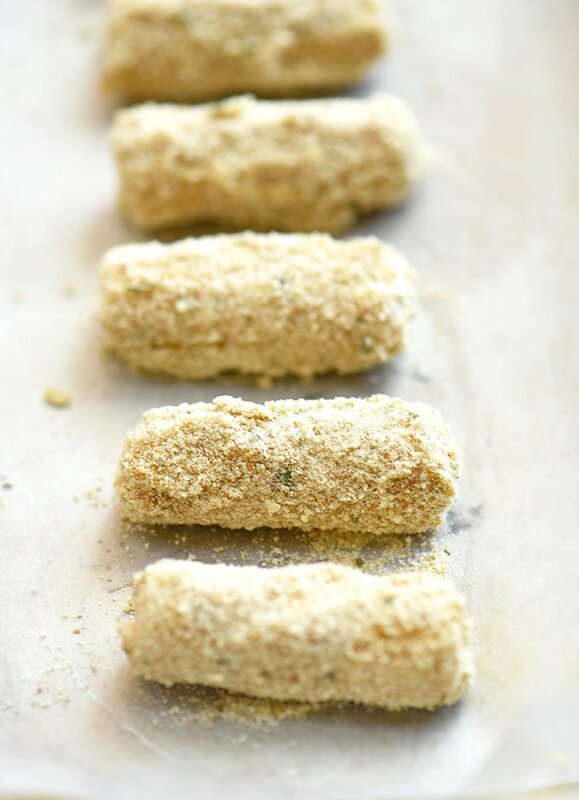 Dredge mozzarella sticks in flour, dip in egg mixture and then roll in breadcrumbs mixture. Dredge again in flour, dip in egg mixtures, and then roll in breadcrumbs to fully coat. 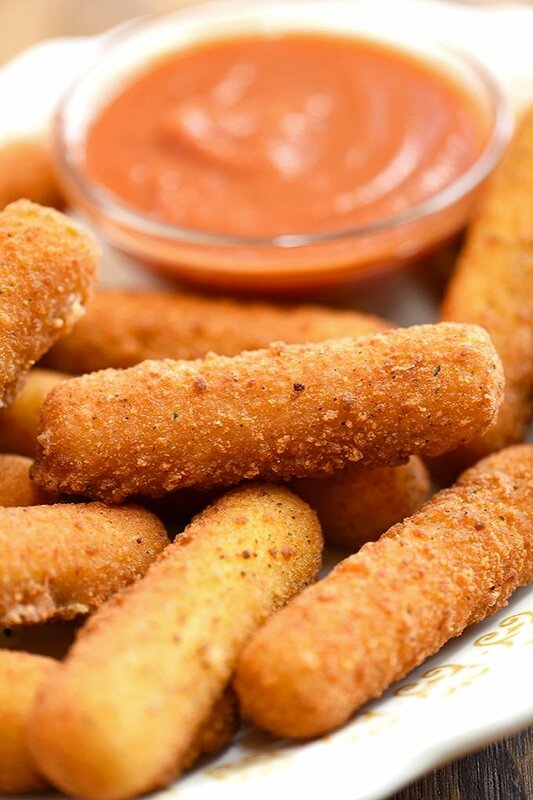 Arrange breaded mozzarella sticks in a single layer on a cookie sheet. Freeze for about 30 to 40 minutes or until firm. In a deep, thick-bottomed pan over medium heat, heat about 2-inch deep of oil to 350 F.
Add mozzarella sticks in batches and cook, turning once or twice, for about 1 to 2 minutes or until golden and crisp. With a slotted spoon, remove from pan and drain on a wire rack set over a baking sheet. Serve hot with marinara sauce. In a pan over medium heat, heat olive oil. Add garlic and cook until aromatic. Add Italian seasoning and season with salt and pepper to taste. Lower heat and simmer, stirring occasionally, for about 10 to 15 minutes to allow flavors to meld. Nutritional Info calculated at 4 pieces per serving.